As you make your plans for increasing your sales in grocery retail distribution, having working knowledge to successfully navigate the evolving grocery marketplace will set your brand apart from the rest and provide greater opportunities to connect with consumers. Choosing the best methods of optimizing the channels in which your products reach your customers can be a daunting process. 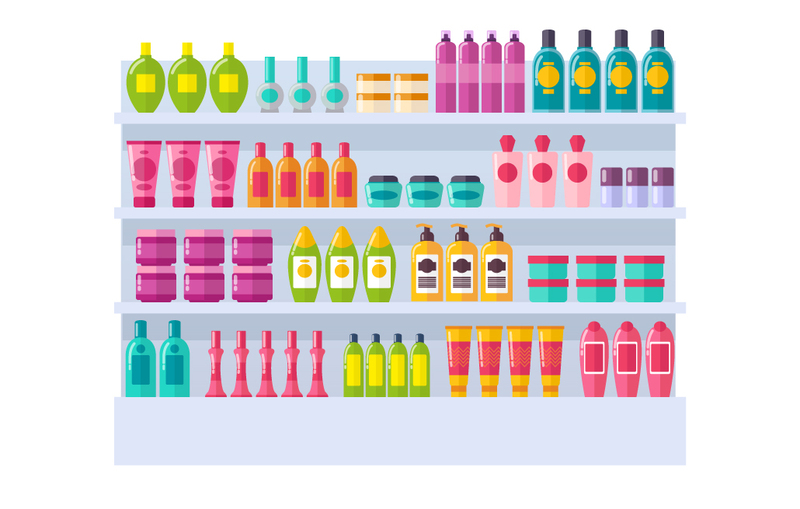 But, with better understanding of industry terms, effective trading partner relationships, and merchandising and promotions strategy, your brand can gain more shelf space with greater efficiency. Successful brands know that there are common and not-so-common terms, specific to the grocery retail industry. Speaking a common language is essential to developing effective relationships and processes with distributors, wholesalers and retailers. As your brand begins to expand its shelf presence, having fluency in grocery trading lingo can accelerate your business relationships by leaps and bounds. When you start out selling your product in a couple of local stores, the initial words you become familiar with and need to know include wholesale price, sell sheet, and MSRP. But, as you grow, the lingo doubles ¬ if not triples. For example: TI x HI, TPR, Off-Invoice, Scan-down, case-pack, inner-pack, UPC, LTL, bridge buying, shipper, FOB and the list continues. Before you approach more retailers, learn and become well-versed in grocery retail vocabulary. Download the Grocery Retail Vocabulary for Emerging Brands to learn common grocery retail terms that you and your team will need to better acquaint yourself with to move forward. Being well-versed in these will help your company successfully maneuver as you seek increased grocery retail distribution. Working with your retailers to fine-tune your in-store merchandising game plan can help generate consumer excitement and drive traffic to your product category. Proper strategy accompanied with accurate consumer data, can open the door for you and your retailer to drive consumer traffic to your category and brand. Your in-store strategies may vary retailer to retailer based on their customer base, the store traffic differences and the store design. 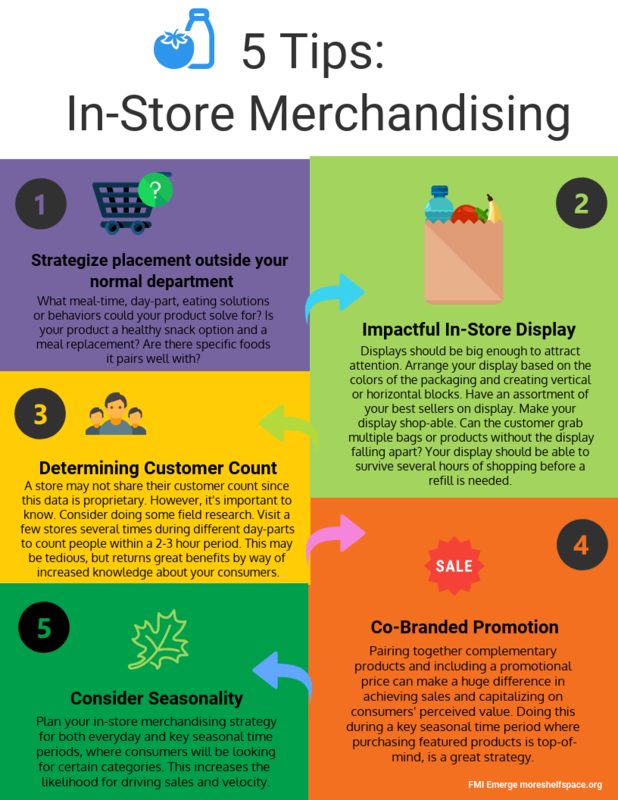 The most important aspect is that you plan your in-store merchandising so they are impactful, effective, seasonal and brand well. Great in-store displays attract attention. Displays should be visually pleasing, engaging, and provide easy access to multiple products without disrupting the shopping experience. Understanding your consumers’ behavior is important. Do your research on what excites your customer. Visit a store at different times of the day and talk to your retailer to gain insights on what works. When planning your display, be cognizant of store volume. It should survive minimum maintenance and refilling. Arrange your display based on packaging colors, creating vertical or horizontal blocks. Consider pairing complimentary products (co-merchandising) and including a promotional price on the set can make a huge difference in achieving sales while capitalizing on the customers’ perceived value. In the competitive world of retail shelf-space, in-store retail marketing, also known as trade promotion can help differentiate your brand’s products from the competition. Trade promotion increases your brand’s visibility, awareness, and introduces new customers to your product through trial and impulse purchases. Retail grocers offer in-store promotions to boost customer loyalty and increase sales. Suppliers can benefit from partnering with retailers to offer promotion campaigns which increase customer satisfaction. A combination of the right price, strong in-store merchandising and effective advertising can give your brand a competitive edge in its category and increase market penetration. Coupons, temporary price reductions, rebates, and contests are all effective channels of building brand and product awareness. Awareness of (KPI) key performance indicators. Is the practice of combining traditional printed style advertisements, along with digital channels to create a firm promotion advertising campaign. Advertising aims to steer sales at the time and place where purchases are made. POS advertising is generally to influence impulse or unplanned purchases by new and loyal consumers. Of the two methods of carrying out in-store sales, POS advertising is proven to be the most influential. Many studies show that the majority of consumer purchases are impulse purchases, or unplanned. POS advertising is a specialized form of sales promotion that is found near, on, or next to a checkout counter or register, and designed to encourage impulse purchases. Buy-one-get-one-free (BOGO) sales and “10 for $10” sales on merchandise are especially popular calls for action to impulse purchases. Evaluate your core shoppers’ purchasing behaviors, including their everyday and seasonal purchasing trends. Knowing your customer behaviors well will help you determine how merchandising, in-store promotions and advertising will support your product velocity and sales. Print advertisements hold a different value for boomers than it does the digital-oriented generation. However, both groups are valuable purchasing groups in grocery retail, so developing an integrated approach to your out-of-store advertising connects your promotions to consumers in a way that they can relate to your brand. Using your e-commerce site to drive in-store traffic may seem challenging or even counter-intuitive, but it can be quite effective at driving more sales. The key is defining what customers want out of the in-store experience, and then translating and/or delivering this experience online. there could be benefits for you to hold a diversity certificate. Don’t miss out. Supplier Diversity is a business process that works to level the playing field for suppliers. Retailers offer Diverse Supplier programs to promote trade participation of suppliers that is reflective of the diverse US population. Some programs include deep discounts on promotions or even no fees because of the certificate. Becoming well-versed in retail grocery vocabulary and promotions will come over time if you focus on gaining experiences and learning the new terms and lingo. As you invest in and navigate building healthy trading partner relationships and planning in-store promotions and merchandising well, you will see results. Its hard to be patient to see your sales results but if you stay focused and true to your brand, the sales will come in time. Track your progress as you dive into the many more topics covering in the FMI Emerge community. If you are a women-owned business, what are the requirements and possible benefits of obtaining a certificate from WBENC.org? Must be at least 51% owned and operated by one or more women who are U.S. citizens or permanent residents. A proactive business process that seeks to provide all suppliers equal opportunities. 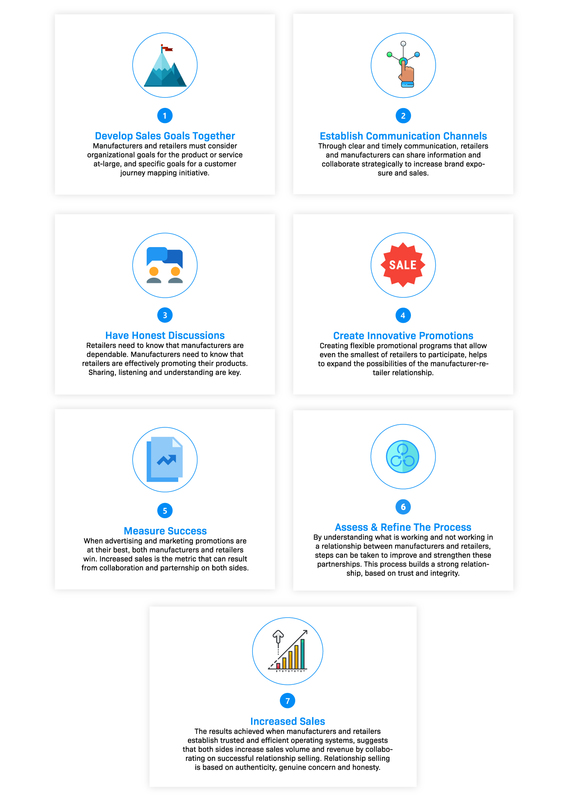 A proactive business process that seeks to provide consumers with diverse product choices. A proactive business process that seeks to provide consumers with several options of the same product. A proactive business process that seeks to provide distributers with several supplier opportunities. What do these acronyms stand for- TPR, TO, TA , SO? What is a boost in sales you get because of an in-store promotion? What means you need to ship product through a freight carrier but your shipment is not a full-truckload? What is one factor you shouldn't need to solve for when developing your in-store promotion?